Sector expert Michael Ballanger discusses the pitfalls of market reversals and forecasting. 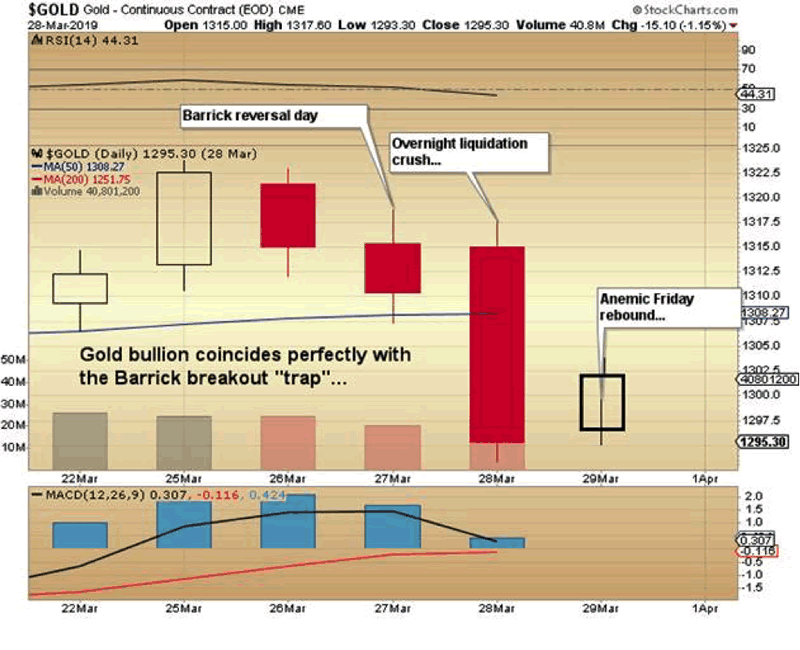 As I reach end-of-week, end-of-month book-squaring, where all of my urgent e-mails and all of my myopic missives and all of my topical tweets are summarized in once terse and quite concise "Monthly P&L," I am astounded at the most recent example of how masterfully the Gold Cartel works in suckering investors into a false sense of comfort and misplaced complacency. 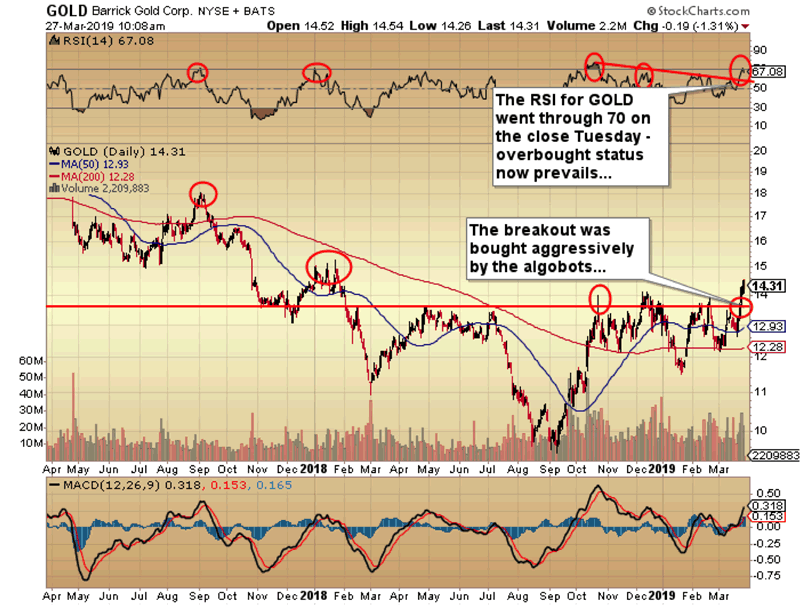 On March 25, just before noon, I sent out the chart of Barrick Gold Corp. (ABX:TSX; GOLD:NYSE) under the title of "New Idea," with the base case being a technical setup at the $14.00-14.10 level that was shaping up to be a pure, textbook break-out from three prior tops in this range dating back to October. I was buying the May $12 calls for $2.15 (50% position) on the assumption that, despite the "less-than-ideal"buy signal I got on March 6, there was a decent trade in this single stock idea, and a pretty easy shot to the $17-18 area. Well, I did buy the "breakout" story, and it was working beautifully, when I came across one of my old missives from 2016, in which I was shaking my fist and "Tsk! Tsk"-ing all those incredibly naïve fools that were actually of the mind that technical breakouts work in rigged market systems. No better proof exists than the hose job we experienced last week. 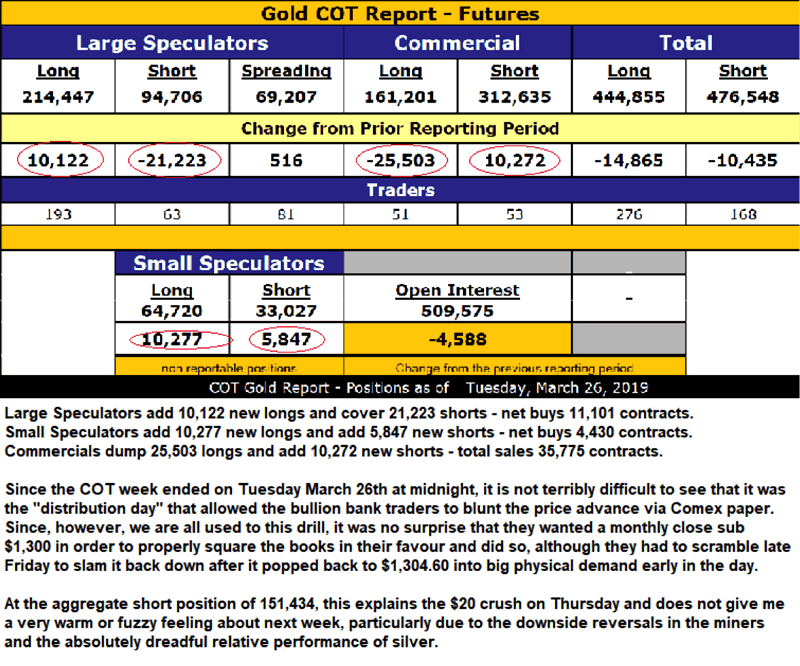 The tweet from Wednesday morning—the reversal day: Should have sent this before the opening but. . .$GOLD was in overbought territory at the Tuesday close and should pull back along with GDX and NUGT. Technical traders reacting to the contrived snare have now been trapped into losing long positions in what can only be classified as a "failed breakout." 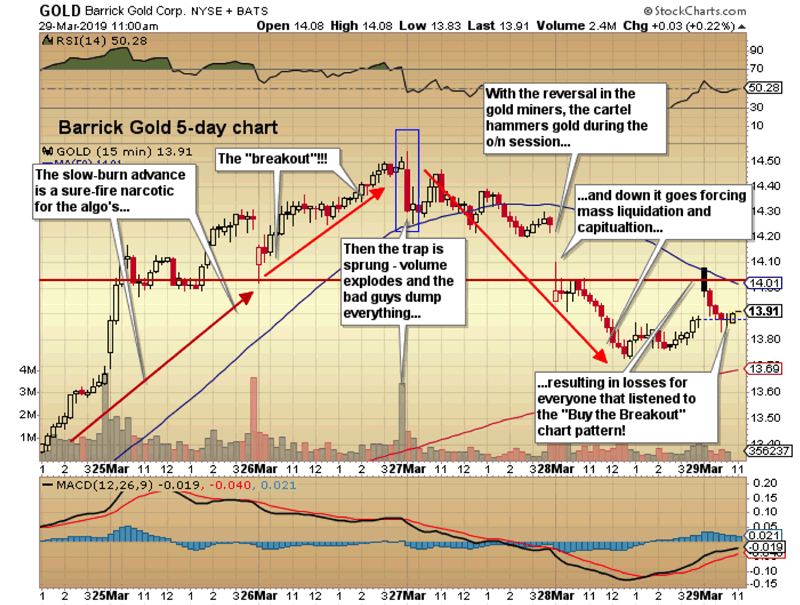 My continuing mantra to "sell breakouts and buy breakdowns!" in the metals and miners is once again proven out, and I vow to never again try to finesse the precious metals markets with the futile fantasy that rigged markets can actually respond in a predictive manner. Total hogwash matched only by its naivety. . .
Stocks I want to clarify my 2019 forecast for the S&P 500 by repeating what I wrote back in early January: "With the Santa Claus Rally period, the First Five Days (of 2019), and the January Indicator all ending positive, there remains a 70% probability of stocks ending 2019 higher." 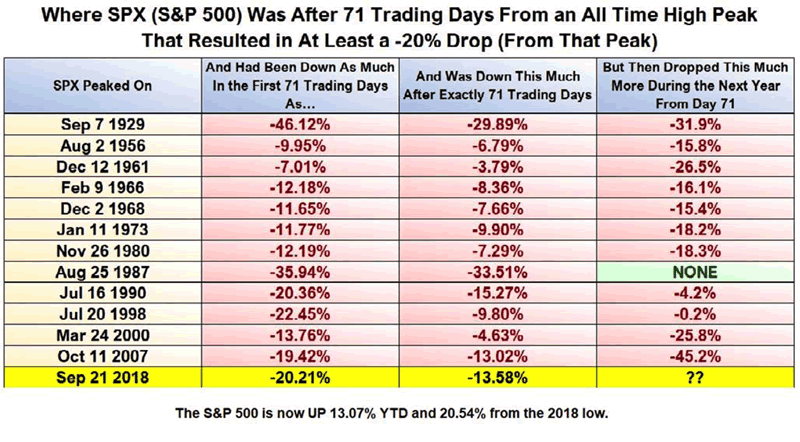 The chart showing what the S&P 500 did "71 days after the bear market arrived" includes data from periods in time before the advent and implementation of government interventions-managed markets. To fight the Fed and the tape is a recipe for disaster, so trying to short the S&P, looking for a retest of the 2018 lows, is certainly going to be an exercise in both bravery—and quite possibly stupidity if the Fed's new "Third Mandate" is successful. 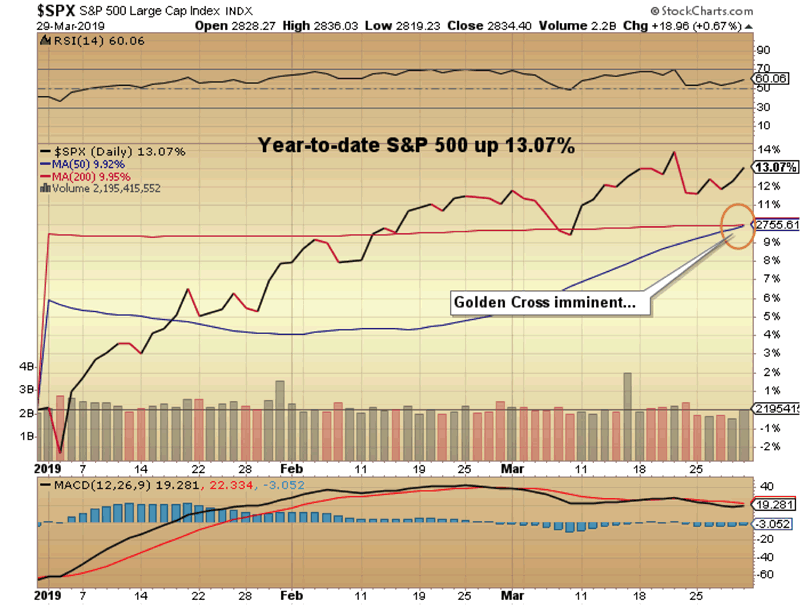 The S&P had an RSI approaching the 70s all through February, and is currently residing in the 60s, suggesting that a close next month through 2,860 for the S&P and 26,000 for the Dow Jones Industrials is now my "line in the Sand," the penetration of which will be a portent of new all-time highs for stocks. I spent all of Friday evening trying desperately to find another cute little anecdote with which to fill out this week's missive but, alas, nothing of merit comes to mind. 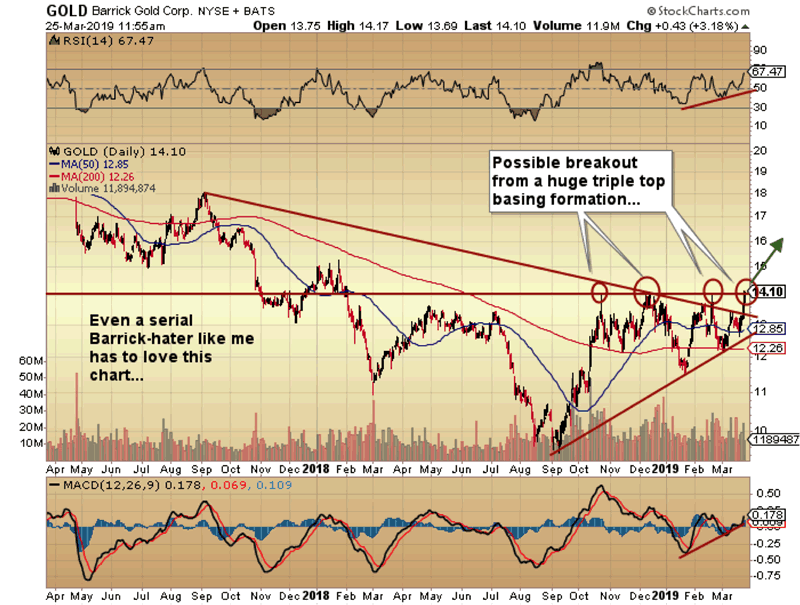 I have been busy with the two big fundings (Getchell Gold Corp. [GTCH:CSE] and Western Uranium & Vanadium Corp. [WUC:CSE; WSTRF:OTCQX]), which are always time-consuming exercises. Both are going to be oversubscribed, no small achievement in a market that is still screaming for weed deals and screaming at mining deals (as in "lose my number!"). I can hear the snore of a large Rottweiler at my feet and the sweet aroma of Yorkshire pudding baking in the kitchen, suggesting that all is clear on the metals front—until, of course, it isn't.